We have shared our vision about why we think feedback must be done differently, and how we do it, but today, I’m excited to share with you something even bigger. Our mission is simple: make the surveys less boring, more engaging and attractive for the end user. Providing you with more feedback, more accurate and better insights. We have different ways and axis that are aimed at fulfilling this mission. We create gamified surveys that works. With that in mind, we decided to sit back and think about how we could help our clients do it better, segment better, and provide a better experience to their end respondents. Let me walk you through some of our recent changes. We have added a notice next to every question in order to warn you about the potential harm of your question. If your question isn’t segmented, we will point it out. Whether you want to add a simple if/then condition flow or a segmentation based on the satisfaction of your respondents, that’s your call, but we want you to segment, and ask relevant questions. Less questions, means happier respondents, mean better results. We believe that the more targeted your questions are, the happier your users will be, as well as the quality of the results. This is why we highly encourage you to segment! Besides educating you on the segmentation of your question. We also provide a Goodwill grade, which is essentially a way for you to know how likely you’re to get actionable data, ie. collect feedback. A: Users are very likely to enjoy giving their feedback and have a great experience doing so. Expect a high engagement ratio. 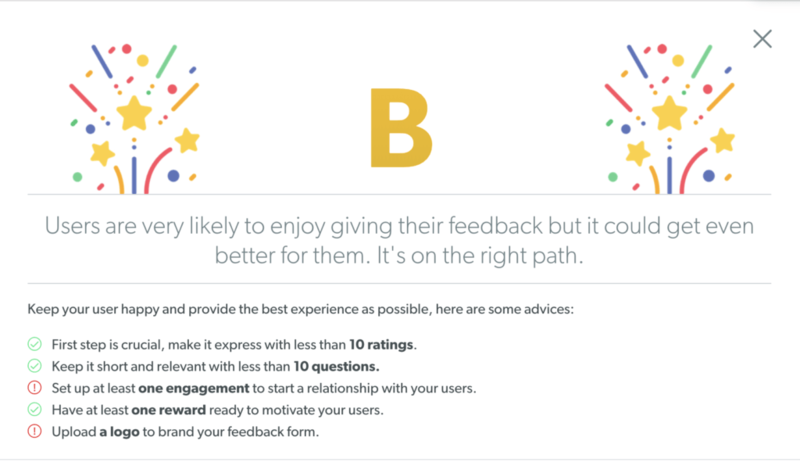 B: Users are very likely to enjoy giving their feedback but it could get even better for them. It’s on the right path. C: Users are likely to enjoy giving their feedback but might not see a difference with other classic survey tools. E: Users are very unlikely to have a good experience and enjoy it and you might see consequences in the results. This is only the tip of the iceberg, there is more to come and to expect.